Western String/Bolo Tie with a 36 inch ( rayon & cotton) cord and metal tips. 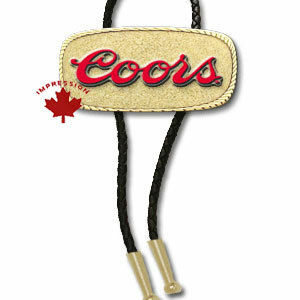 We can custom manufacture your design as a Bolo Western Tie in base metal or in solid pewter. The base metal Bolos can be finished with a black, brass, gold or silver plating. 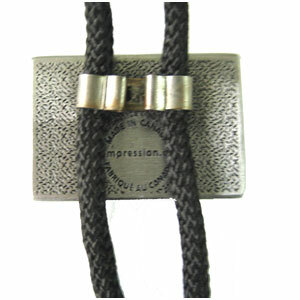 The pewter Bolo Ties are available only with a pewter finish. The image shown is of a Western Bolo Tie that we have made for another client. Your own custom design or shape (such as round, oval, square or rectangular) with applied colour fill can be manufactured in our plant. The standard size is 1-1/2 inch long and the thickness of our Bolo is 3 mm; thicker sizes are available at an extra cost. Round 1-1/2" $7.95 $6.95 $6.50 $6.10 each. Square 1-1/4" $7.31 $6.75 $6.30 $6.10 each. Oval 1-1/2" L x 1/2" H $7.95 $6.95 $6.50 $6.10 each. Rectangular 1-1/2" L x 1/2" H $7.95 $6.95 $6.50 $6.10 each. This is our standard BoloTie back. Other backs may be available at an extra charge of $3.50 for each piece, when 360 piece or more are ordered.